Join us for a one day workshop enhancing your Print Competition images. Stay the night and we will see you at PPOK's Past President's Seminar on Sunday. REGISTRATION ENDS THURSDAY, JAN 19TH! Are you nervous about your SWPPA & PPA competition entries? Want input on your images before entering? Want to learn from Master Photographers? Entering SWPPA and PPA print competition is one of the best ways to push yourself to be more. Learning from print competition also enhances your studio work. 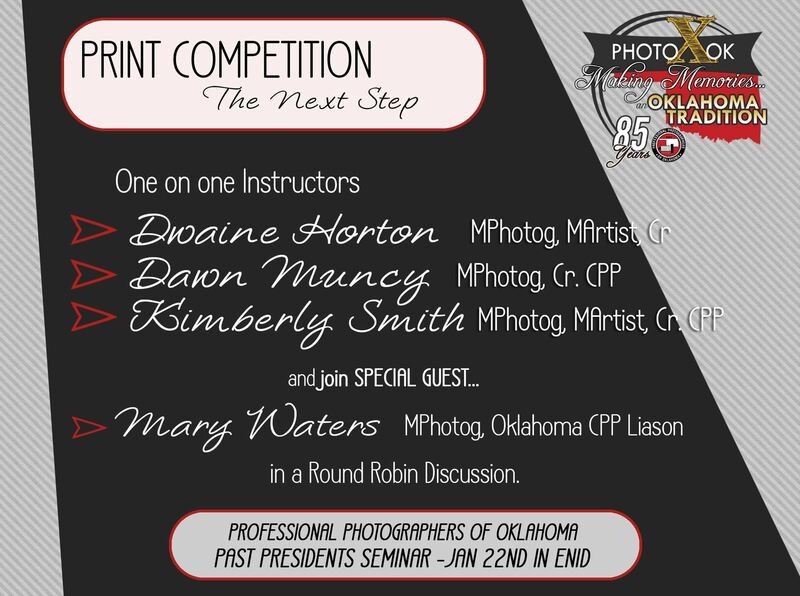 Each attendee will have several minutes for direction on their images with Dwaine, Dawn and Kimberly. 4 images (or 6, if you want help narrowing it down to 4. The instructors will only work on 4 images. The images must be saved as a jpg low-res file (longest side 6 inches or 1500 pxls) no high-res files will be edited. Please save a copy on a jump drive.